Michael Myers from the newest Halloween. Michael Myers, the star/monster of the Halloween films, has had a wild, wild history. This video, from Tell It Animated, runs down just how wild it’s been. 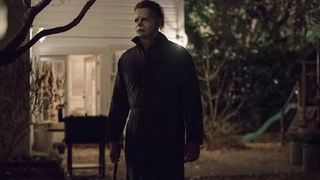 Over some 40 years of movie horror, Michael Myers has gone through a variety of masks, body types, moods, and resurrections over a really surprising amount of films. Beware of spoilers: this cute cartoon recap covers everything, including the newest reboot, exploring how Myers’s look and role in the story changes. Also, did you know there’s one Halloween movie that he’s not even in? What a weird franchise, am I right.